When it comes to reducing the risk from flooding in your community, everyone has a role. Make sure you understand what the flood risk is for your property and the best ways to protect it and your loved ones from flooding now and in the future using the information below. After you’ve taken steps to reduce your flood risk, share your story so others can learn from your experience. First, make sure you understand the risk from flooding for your property. You can look up your flood risk by address using the “What is my BFE?” tool. This tool lets you compare the most recent FEMA flood hazard information for your property with information from the current effective Flood Insurance Rate Map. Make sure you have a plan and supplies in place for when a flood happens. New York City residents can find information about how to prepare for a flood on the Ready New York website. New Jersey residents can get more information from the New Jersey Office of Emergency Management. 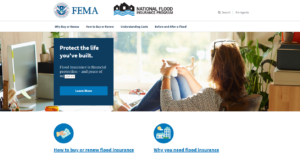 Visit FloodSmart.gov or contact your insurance agent to find out more about flood insurance. Remember that flooding can happen anywhere it rains – Preferred Risk Policies are available at a discounted rate for properties not located in a high risk flood zone. You may also want to read about recent flood insurance reform legislation and how it affects certain policyholders. Consider making changes to your home or business to protect it against future floods. Learn about retrofitting measures you can take and best practices for construction in coastal areas using the resources below. Use flood damage resistant materials for walls, floors, and other parts of a building that are below the Base Flood Elevation (BFE). Improve drainage and reduce excess rainwater – Drains that get blocked and rainwater that is not absorbed into the ground can cause flooding. Install gutters and downspouts; use gravel, pavers or grass for parking areas, driveways, and patios; add plants and trees to your property; and clear brush and trash away from drains. Raise utility systems and appliances – elevate the main breaker or fuse box and meters, air-conditioning units, furnace, water heaters or other heavy appliances that could be damaged during a flood. Install sewer backflow valves or check valves to protect buildings from sewage backups. Anchor fuel tanks. Unanchored fuel tanks can easily be moved by flood waters which can pose a serious threats to you and your property. Remember, before making changes to your property, contact your community officials to make sure you understand any building and permitting requirements that will apply. They can also provide information about federal and state grants and funding which may be available to help you too. Check with your local officials for other resources that apply for your community.